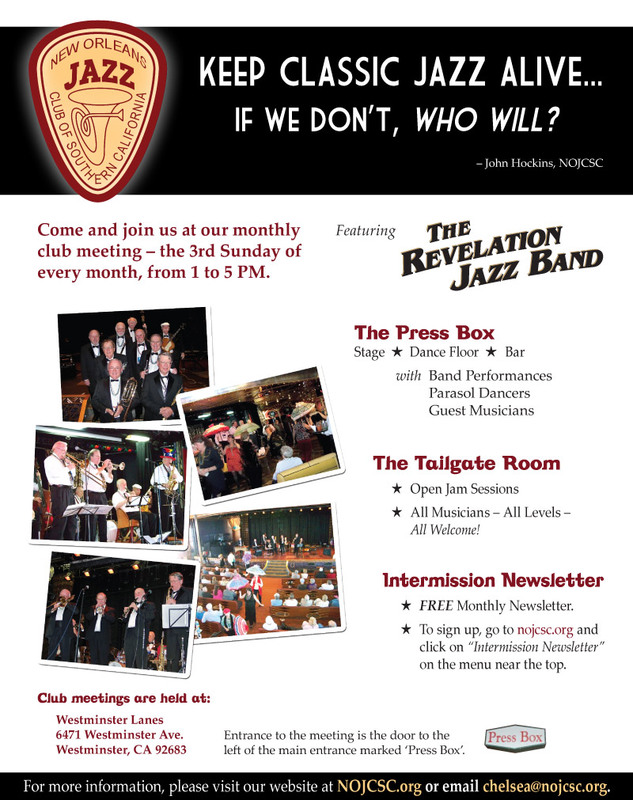 Join us at our next club meeting on Sunday, June 16, 2013 at the Press Box at Westminster Lanes (info below) for an entertaining afternoon of traditional Jazz and Swing featuring the REVELATION JAZZ BAND — Great Music for dancing, and a GREAT place to celebrate Father’s Day! PLUS ‘open jam’ sets during the afternoon. Musicians bring your instruments and get involved! The Tailgate Room is there for you. Live Music from 1 PM to 5 PM. Big Daddy’s Cafe, offering delicious food and snacks. Tailgate Room — musicians, bring your instruments for a jam session. Sign in with the music director, Alan Shelton. Swamp Donkeys’ OC Tour Stop! The NOJCSC was privileged to have hosted The New Orleans Swamp Donkeys Traditional Jass Band at our last meeting on May 19th. "We are touring from New Orleans to the Sacramento Jazz Fest then all the way to NY with a kick off at Preservation Hall in New Orleans. Some other venues that we have on the docket are the SOHO House and Dizzy’s Club Coca Cola in NYC." We wish them great luck on the rest of their tour! NOJCSC is now on Facebook! Late Breaking News… This just in! our website at nojcsc.org is undergoing a complete revision and update. Watch this space for further announcements! The Club now has its own page on Facebook. "Like" our page to receive updates on Facebook. Advisory Notice to our Members and Guests: We will from time to time use photographs and video taken during the course of our Club Meetings. These photographs and videos may be used on our Facebook page or website. Any member or guest must inform a board member if they do not wish to have their photo taken or appear in either photographs or video that may be posted on those sites. Fred is a dedicated supporter of Classic Jazz and filmmaker. At our Jazz Club meetings you will see him festooned with his equipment taking on average two hundred (!) photos of our members having a good time, and he has been doing it for years. He also travels extensively to Jazz Festivals and makes great videos of the bands and the audiences enjoying the music. Fred’s recent filming of the Sacramento Music Festival’s Swing Dance/Lindy Hop Dancers Competition is a ‘classic’ and a guaranteed way to attract the younger crowd to our Jazz Festivals, and, I would add, our Jazz Club’s/Society’s monthly meetings. Thanks Fred! Catch up with Fred’s latest latest videos by going to the website www.wxyzvideos.com. If you are interested in having Fred make a video of your event you may contact Fred at f.harshbarger [at] sbcglobal [dot] net. NOJCSC is constantly seeking new members, and we’d like to encourage you and your families to become members of our Club. The Club was formed as a non-profit corporation in 1968 and is administered by volunteers whose aim is to perpetuate the living American music art form known as New Orleans Jazz. 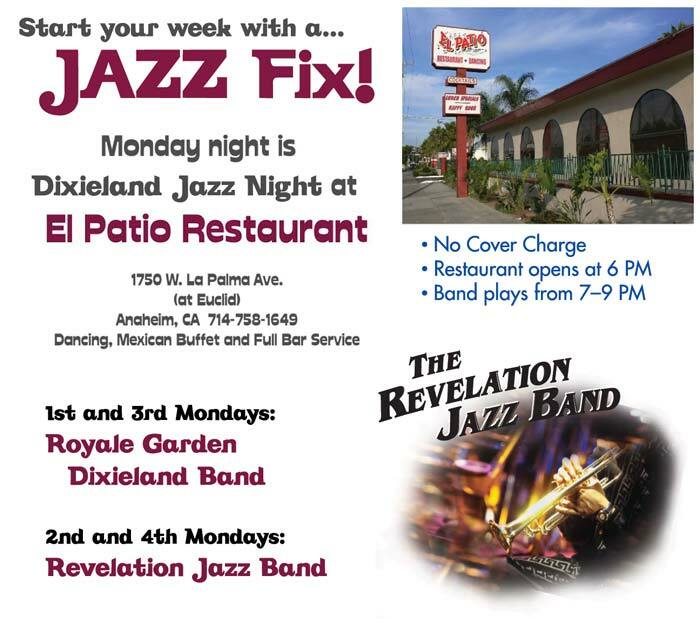 Lots of great Classic Jazz performances, dancing and an all-around good time. The music is the foundation, but our focus is fun! We aim to return every dollar of the membership fees back to the members to better their enjoyment. We have four buffet luncheons every year, in addition to door prizes and snack bowls on the tables — all at no additional cost. Lots of friends who also enjoy Classic Jazz. The Club provides a venue for all members to come together once a month and enjoy the music, dancing and camaraderie. And door prizes. Lots of instrument time with Tailgate Room jam sessions. The Club also provides a "Tailgate Room" where musicians at every level may play their instruments with the assistance and coaching from more experienced musicians. “Keep Classic Jazz alive. If we don’t, who will?”. All of the above are one-time donations for the year and include entrance to all normal 3rd-Sunday Club meetings. For more information about our club or to see past issues of Intermission, please visit http://nojcsc.org/. If you have any questions or would like to try your hand at editing this newsletter, please contact NOJCSC President Chelsea Joy at chelsea nojcsc [dot] org or 714-930-6261.